I do not have a "style." My work is mainly off-loom seed bead weaving and bead embroidery. Whatever strikes my fancy. I look at the work of other artists, bead and otherwise, and the materials I want to use give me ideas of a general direction for my next piece. Some of my best work has been produced as entries in the Indiana Bead Society Annual Bead Challenge where I must work within a prescribed set of parameters. I work mostly with seed beads. They are found in nearly every piece that comes out of my studio. Lamp work beads, gemstone beads, sea shells, natural stone and glass cabochons, fused glass shapes, pressed glass beads, and even a few crystals are the focal points and accents to the structure provided by seed beads in various off-loom weaving techniques and bead embroidery. The Peruvian opal beads themselves inspired the bracelet. I had only a general idea of what the finished bracelet would look like. The slight variations in shape and color of the large Peruvian opal beads told me that each bezeled bead would be unique- front and back. No two of the twelve elements have the same bead combination. 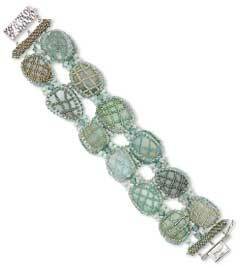 There are over a dozen different light bluish-green size 15 seed beads used in this bracelet. When I started, I thought that ten large elements would make the bracelet long enough. No. I made two more and started to connect the pieces. It was still not long enough, so added the bars at the end before adding the clasp. I am a girl. I have loved and been fascinated by jewelry since I can remember. (I still have an unfinished bead piece that I did on one of those small wire frame looms with the spring spacer that I made when I was ten or eleven.) If a technique uses a needle and thread/fiber, I have probably tried it. I spent a great deal of time over the years doing needlepoint, clothing construction, crewel embroidery, knitting, quilting, and counted cross stitch before "settling down" to beadwork sometime in the early 1980's. I took a year of metal work in college as an elective, concentrating on lost wax casting. I spent a year as a bench jeweler for a small custom jeweler with a retail store. After that first year I worked for them part-time for fourteen more years at retail sales, jewelry repair and doing all of the pearl restringing repairs. I have knotted hundreds of feet of pearls. That connected me with a bead store in town and beading has been my main hobby interest since then. I have no formal artistic training except for the year of metal work in college. I do not remember. It seems the name and the catalog have been omnipresent since I became serious about beads and needed supplies I could not find locally. I like to work in the garden. Currently I am working with a study group developing my own visual language to use in making art/studio quilts and to inspire my beading. I am a member of and the Education Chair for the Indiana Bead. I also participate in a small group (8-12 in each meeting) that meets every other Friday afternoon during the summer. We call ourselves TGIF-B (The Girls In For- Beading.) For the past two summers we have taken turns teaching one small project per meeting. This summer we decided to try something different and are tackling a multi-component necklace. We will take turns teaching and learning many small parts such as leaves, flower, and geometric shapes. By the end of September each participant will have a necklace assembled of many components that have been made by herself as well as every other lady in the group. It's a hobby. It's a passion. I need to make things with my hands. I keep most of my work for myself but many of my friends and family have received bead work jewelry as presents over the years. I make no effort to sell any of my work. Last year was the first time I entered any sort of contest other than the bead challenge at the Indiana bead society. I entered a piece in the Fire Mountain Gems contest and tied for third place in the seed and bugle bead category. I also entered two pieces in the Indiana state fair last summer and won a second place and honorable mention. Just do it!! Have fun. Make something beautiful. View all of Carol's designs in the Gallery of Designs.